The USB 2.0 to HDMI/DVI/VGA display adapter allows you to attach one or multiple HDMI, DVI, or VGA monitors or projectors to a laptop or desktop using USB 2.0 ports. There is no need to have an additional video card installed. Up to 6 display adapters can be connected to one PC. 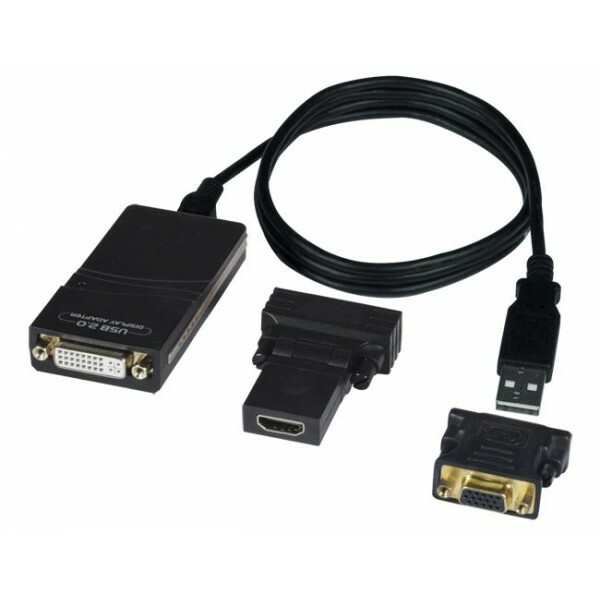 Connects an HDMI/DVI/VGA display to a USB port. The connected display can be the only video output. The monitor connected via the USB2-HD-LC will work whether or not another monitor is connected to the video port of a computer. A monitor connected to the video port of a computer is only required to install drivers for the USB2-HD-LC. Standard and wide screen aspect ratios. Available modes: Primary, Mirror, Extend, and Screen Rotation. Primary: displays the screen on one monitor. Extend: displays different programs from one computer on multiple monitors. Mirror: displays the same screen on multiple monitors. Image rotation: 0°, 90°, 180°, 270°. One female DVI-I port for connecting a display. Connect an HDMI or VGA display using the included adapters. One female Mini USB Type B port for connecting to a PC. Operating temperature: 50 to 104°F (10 to 40°C). Storage temperature: 14 to 176°F (-10 to 80°C). Operating and Storage Relative Humidity: 0 to 85% non-condensing RH.